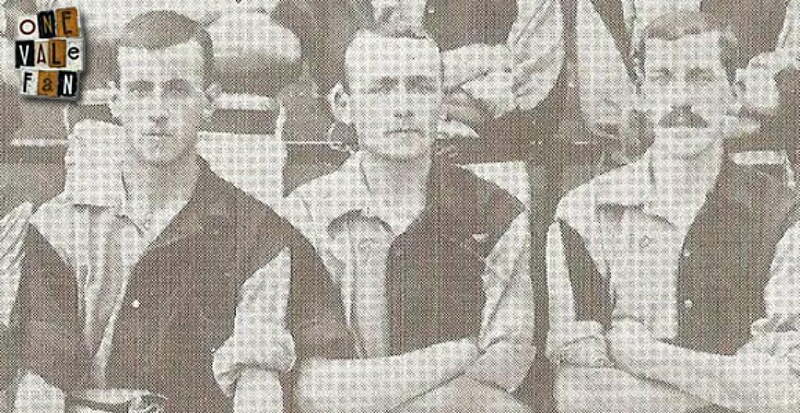 Adrian Capes (pictured centre above) was another one of those historical Port Vale characters who is little known nowadays despite his long association with the club in a number of roles. He was born in Burton-on-Trent and began his career as a centre-forward at Bolton Wanderers alongside his brother Arthur. In 1900 he signed with Port Vale and was then to spend over half a century in the Potteries. His playing career with the Valiants was certainly impressive. He started by scoring 17 goals in his first season and hit the twenty mark in his second, including a purple patch of six goals in five games in March 1902. In 1902-3 he hit eighteen goals and in 1903-4 he hit 17 as he finished the club’s top scorer for four consecutive seasons. By 1905, he had attracted the attention of neighbours Stoke and after 69 goals in 181 appearances, his first spell with the Vale ended as he joined the Potters. However, his two-year spell with City ended in relegation and after a two year spell out of the game he joined Vale in 1908 for a second spell. The club were in dire straits at the time. The club had left the Football League and were competing in the North Staffordshire & District League. Now a veteran of 35 years of age, Capes began well with fifteen goals in 31 games but a serious knee injury in 1910 effectively ended his playing days. He was 37 years old and had scored 84 goals in 214 games for the Valiants during his two spells. Despite his injury, Capes remained with Vale and was a trainer from 1911 until 1919 and remained in various backroom positions until his retirement at the age of 61 in 1934. Adrian passed away in Smallthorne in 1955 aged 82 years of age.